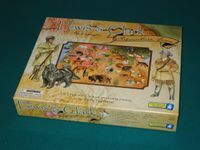 From the back of the box: Join Lewis and Clark on their expedition from St. Louis to the Pacific Northwest! As you follow their route, you'll explore the wilderness by keelboat, canoe, horseback, and on foot. Along the way, you'll meet Native American tribes, see spectacular places, and encounter unfamiliar plants and animals. Your survival depends on knowledge, skill, and luck! Supplied with a provision of beads, you'll give figts or trade for goods--just like Lewis and Clark did! You'll also get a chance to spin a special compass, answer questions, and win four types of charms. If you're the first to complete the journey with all four charms, you win!